Our everything cabinet was in desperate need of a makeover. For the past year, we have just been throwing things in there. Well, today I'm happy to report, it is finally organized, and I'm super excited to share the reveal with you guys! I learned a lot during the process, so I hope you come away from this post with some helpful ideas. If you are looking for some home organizing tips, you've come to the right spot! Scroll down to the end of the post for a video. In our sitting room, which is at the end of our great room, we have what we call our "everything" cabinet. It's a home office storage unit of sorts. I dreamed of beautiful built-in bookshelves styled perfectly with vases, artwork, and books. However, with a toddler and a baby, that just wasn't realistic. Also, I really needed a spot for my props. And Mikes and I needed a place to house our important documents, photos, printer, etc. Hence our everything cabinet was born. It has actually been one of the best decisions we have made. It's been really convenient to have all of this "stuff" located where we spend most of our time. Our everything cabinet didn't start off looking like the photo above. It was organized when we first put it in (we actually had it at the old house and brought it over when we moved ... our renters wanted to keep it because they loved it so much). But little by little, we got lazy and just started throwing things in there ... until it got so full we couldn't add anything else. It was time for a makeover. Much better right? I'll break it down for you guys and offer some tips. I'm not an organizing expert by any means, but I sure do love organizing. Tip #1: Start with your stuff not your container. I think the best tip I have is to start with your stuff not your container. What I mean by this is I feel like when people want to get organized, they go to the store and buy a bunch of bins or containers. And then they get home and throw everything inside. My tip is to first get an inventory of your stuff. Then go through each item and figure out what is the best container for each thing you have ... and essentially build your storage around your stuff rather than fill up your storage with your stuff. Here is a small example. I used to have our printer paper laying flat on a shelf. It was not a great use of space, and it was messy. Sheets of paper were constantly sliding off, and it was never in a nice neat pile. This time around, I put our printer paper in a magazine holder with some other supplies like mailing envelopes and our clipboard. Now it's contained, neat, and it doesn't take as much space standing vertical. See the image above for reference. Tip #2: Adjust and readjust your storage until it's just right ... aka be patient. 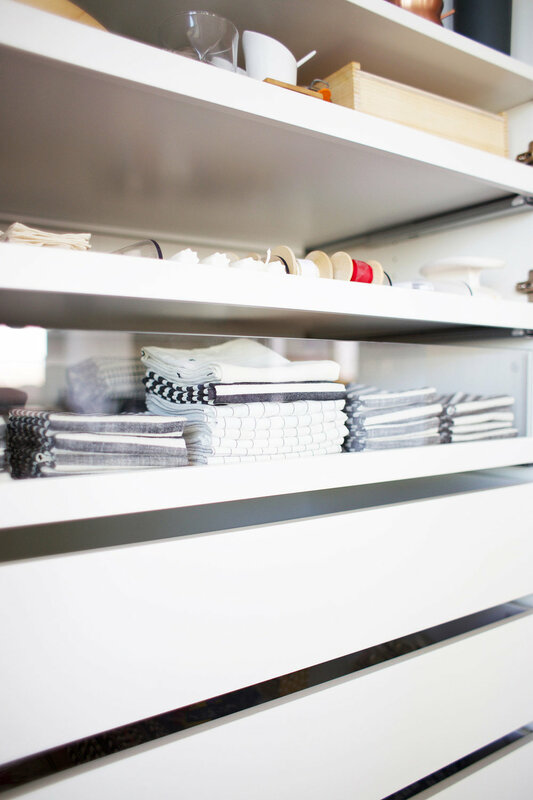 My second home organizing tip for your everything cabinet takes some patience. I recommend adjusting and readjusting your storage unit until it's just right. Trust me on this one. It takes time, but you won't regret it. I moved shelves up and down and switched out drawers to trays and trays to drawers until everything was just right for our stuff and space was maximized. In case you are wondering, the cabinets you see here are the PAX System from IKEA. This post isn't sponsored or anything. I am just absolutely obsessed with the PAX System. It's a customizable storage unit: you pick the cabinets, doors, and inserts. They have a ton of great options. They have different size cabinets and really cool doors. And my favorite thing about PAX is the inserts. They have really awesome shelves, trays, trays with dividers, drawers, etc. I haven't checked in a while, so I don't know if they still offer it ... but IKEA used to have an online design tool that allowed you to completely design your own system, inserts and all. It was amazing. We used it, and it was so helpful. We are going to use PAX in our master closet. I will be sure to show you guys when it's done. Tip #3: Use pull-out trays to save vertical space. Pull-out trays allow you to save vertical space. You don't have to allow for space to get back into a shelf to pull out an item. My favorite use for a pull-out tray is with a printer or shredder. A printer or shredder can take up a lot of vertical space. I recommend putting your printer and shredder on a pull-out tray as opposed to a shelf. That way you can pull out the tray to use the printer or shredder, and you don't have to leave extra space above the items to allow you to get in there to use it. Does that make sense? My third home organizing tip is to use drawer dividers or tray dividers. They keep little items neat and organized. And instead of buying a bunch of plastic containers or trays, you can use just one drawer divider to wrangle your stuff. Tip #5: Place larger items in the back and smaller items in the front. My fourth home organizing tip is for shelves. For shelf items, I like to organize them by kind and then line them up biggest items in the back and smallest items in the front. This way you can see everything you have. Tip #6: Use felt for delicate items or items that will slide. 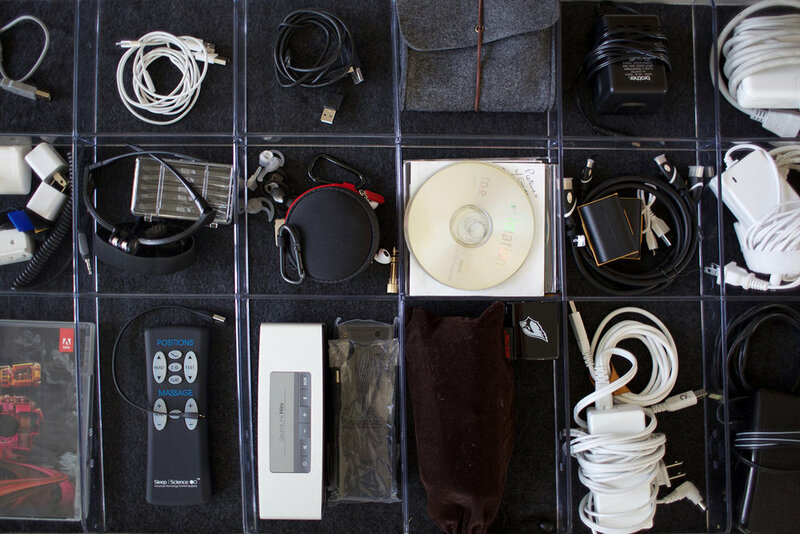 A felt drawer liner is great for cords or delicate items. It is also great for protecting your drawers from items that might scratch like my tripods. The PAX System has felt liners that are already cut to size for the large drawers they offer. Tip #7: Use clear front drawers for organizing stacked items. My next home organizing tip is to use clear front drawers for textiles and other stacked items. This allows you to see what you have. My final tip is to leave some empty drawers. I don't know about you but as minimally as I try to live, I inevitably collect more stuff. You don't want to constantly have to rearrange your everything cabinet as you collect more, so I recommend leaving some extra room. Hope you enjoy this video I made! It would absolutely make my heart sing if you subscribed to my channel on YouTube. 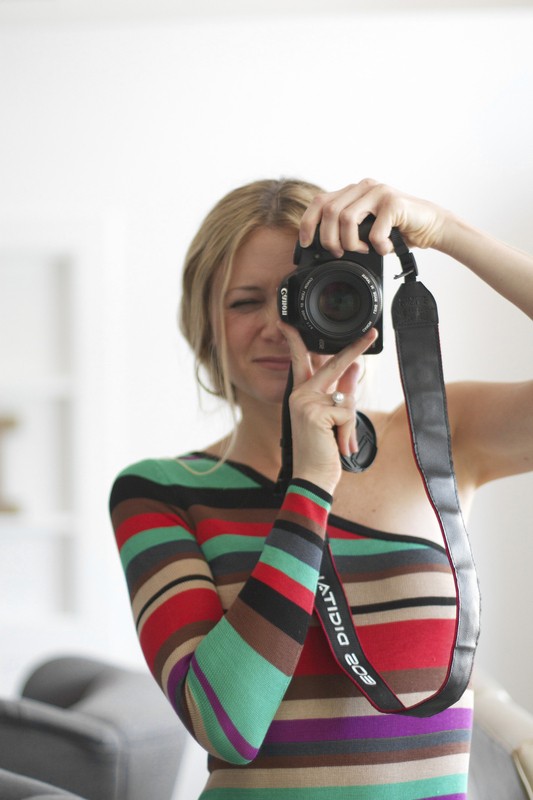 I share quick DIY, home, recipe, and lifestyle videos there. Do you guys have an everything cabinet or am I the only weirdo?